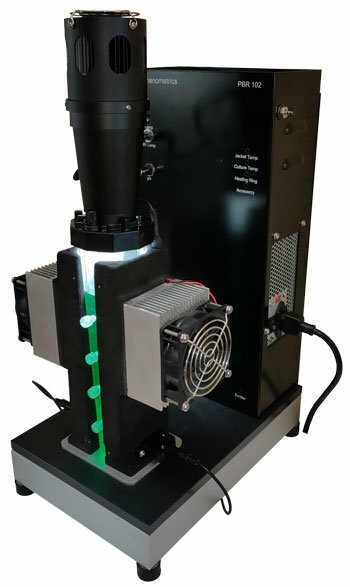 Phenometrics’ upgraded photo bioreactor system, the PBR102-FTM, which includes the FSL-200 Full Spectrum Light system. 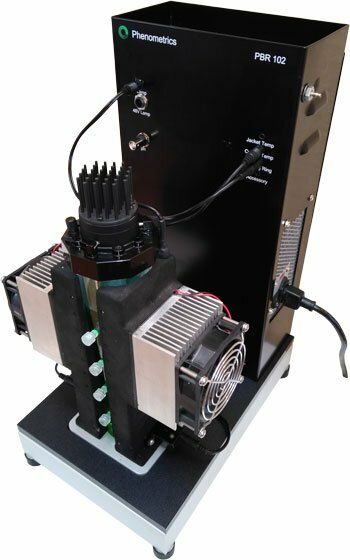 ansing, Michigan-based Phenometrics Inc., a highly respected innovator in benchtop photo bioreactors, has introduced two upgraded PBR systems, the PBR102-F™, which includes the FSL-200 Full Spectrum Light system, and the PBR102-S™, with Standard spectrum light. The PBR102-F and PBR102-S are computer-controlled compact desktop systems that allow the user to simulate aquatic pond conditions using temperature change and diurnal light cycles. It can be used for dynamic monitoring of algae, as well as configured into a matrix of +25 units, greatly reducing the laboratory workload, improving algae growth, and saving time, resources and money. “Scientists and pond managers will appreciate the compact size, versatility and the ease of use of the new PBR102 series,” said Jody Burgess, Phenometrics President and CEO. In addition to research and pond optimization applications, the PBR102 series of photo bioreactors are valuable teaching tools for universities training young scientists and increasing their capabilities with advanced lab-class technology. One of the differences from Phenometrics’ earlier model PBR101 is the new location for the Optical Density sensors (OD). The OD sensors, previously located at the base of the culture vessel, were prone to corrosion by leakage from the culture vessel, and are now located on the sides of the thermal jackets. This not only solves the corrosion problem, but it improves the focus and alignment of the OD sensors themselves, providing better optical density data. The lower-priced PBR102-STM has the standard light, similar to the light used in the PBR101, but it also features the side mounted OD sensors. Another new feature of the PBR102-F is the addition of the FSL-200, a superior LED whose light produces a more accurate solar spectrum and provides a higher intensity of up to <5000 μmol photons m-2 s-1, compared to the Standard LED light, which goes to <3000 μmol photons. Scientists and lab managers who are specifically concerned with simulating outdoor growing conditions for scaling up will benefit by using the FLS200 light. Since the FSL-200 more closely matches the spectrum of sunlight, it will improve data results displayed by the Algal Command™ control software and transfer more closely to downstream ponds. The PBR102-S has the standard light, similar to the light used in the PBR101, but it also features the side mounted OD sensors. The PBR102-S is priced lower for limited budgets. Labs and production companies that purchase the standard light PBR102-S, will be able to upgrade to the FSL200 light without modification in the future. The PBR102 series has an integrated single lead pH probe making it easier to use and clean. The PBR102 also has an upgraded circuit board that supports the FSL200’s higher power requirements. 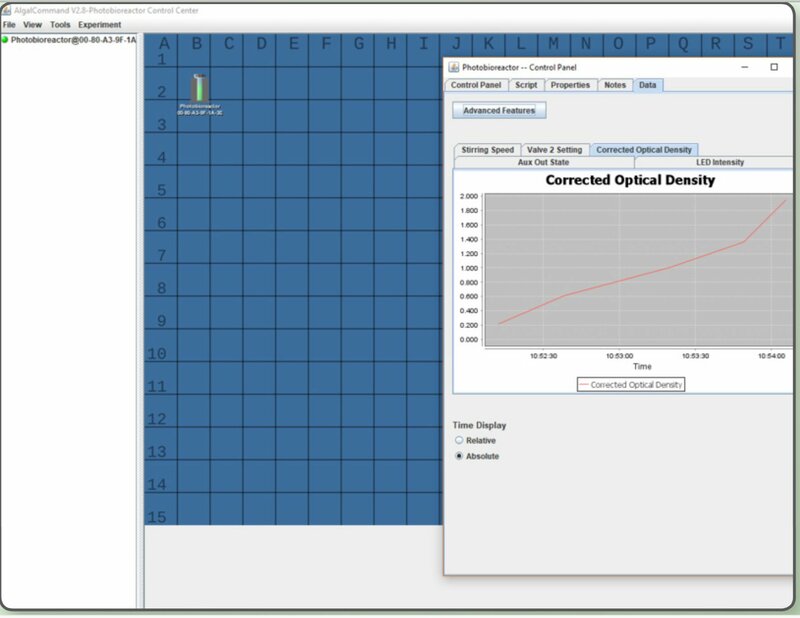 Algal Command software controls the photo bioreactor and generates data and can be used for individual photo bioreactors or a matrix of up to 25+ PBRs. “One of the comments we often receive from our customers is how much they appreciate the quality of the data generated from the Algal Command software during their experiments,” said Mimi Hall, Phenometrics’ Director of Sales and Marketing. The Algal Command software controls the photo bioreactor and generates data for individual photo bioreactors, or a matrix of up to 25+ PBRs. (Click to enlarge).